The international Steering Committee, created within the project, will contribute positively for improving the quality of scientific management, strategic planning, and assessment of the scientific results of the Faculty. This Committee will provide an indispensable mechanism in evaluation, advising and control of the activities within the Faculty to attain research excellence. (a) Initial kick-off meeting of the SC in month 2, which will include: – establishment of the SC and election of coordinator and vice-coordinator of SC; presentation of the activities and plans for development of all research groups participating in the project; detailed analysis of the work plan, the strategy and concrete activities for its implementation; discussion and acceptance of the criteria for selection of candidates for short-term exchange. (b) SC meeting in month 12 for the assessment of the results during the 1st year and detailed analysis of the activities for the 2nd year of the project. 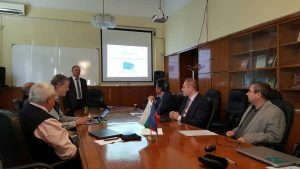 The meeting will be combined with the first general workshop on the project. (c) SC meeting in month 24 for the assessment of the results during the 2nd year and detailed analysis of the activities for the 3rd year of the project. (d) Final meeting of SC meeting in month 36 for the assessment of the results on the project, discussion and approval of the plan for the future sustainable development of the Faculty after completion of the project. (e) Between the meetings the SC members will be regularly informed (every 3 months) about the activities on the projects and decisions and actions of the MC, and their recommendations will be taken into account in the course of the work.